Baking and Mistaking: Best Cookies Ever? 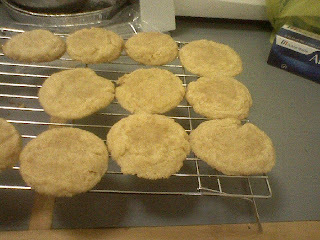 These snickerdoodles were simple to make, and tasted great too - they were gone in minutes! The recipe for these comes from recipezaar.com - once again, and I decided to try them out since they had almost 100 positive reviews. I almost never make recipes that aren't reviewed, since I want to know how they turned out for people, and what changes, subsitutions and problems they made. Anyway, practically every reviewer raved about these, so I figured I should try them. I had no problems with the baking, they went smoothly and came out great. Rolling the dough in the cinnamon and sugar adds a great outer layer that looks pretty and tastes great. However, I did encounter some issues when...purchasing ingredients. Yeah, most of you are probably thinking, huh? What could go wrong? Go to store, buy ingredients, return home, bake. I read the recipe, and saw that it called for baking soda and cream of tartar, not baking powder. I vacillated about whether I should just substitute instead of buying, since I knew I didn't have cream of tartar and I wasn't sure if I had baking soda. Eventually I decided I would go out and buy the cream of tartar, as I wanted to make sure the recipe was the best it could be. Well, I set out for the grocery store, and picked up the cream of tartar in the baking aisle. Then I got on line for the checkout. "Oh wait, do I have baking soda?" "Probably should have checked before I left." "I'll be really annoyed if I already have it." "Oh whatever I probably have some already." Well, I was wrong. Returned home, opened the cabinet...nothing. Clearly checking before I left would have been to much effort. Or forethought. Two words apparently not in my vocabulary. Well at this point I was not going to go out again, so I just improvised, adding the right amount of cream of tartar, and a little less than double the amount of baking soda called with baking powder. They still were great, and next time I'll do it right and compare. Note to self (and all): Check your ingredients before you head to the supermarket! Tip of the Day: If shaped or roll cookies don't hold up, refrigerate a little while longer to make a stiffer, easier to work with dough. Beat together the butter and sugars until well mixed. Add in the egg and vanilla and beat until smooth. Gradually mix in the flour, salt, baking soda and cream of tartar. Allow the dough to chill for an hour in the fridge. Form 2 tbsp of dough into a ball and roll in the cinnamon and sugar mixture. Bake on 300 F for 10 to 12 minutes.